Do You Know Your Recruiting Costs? Recruitment process outsourcing (RPO) can do really great things for an organization’s hiring function, but success isn’t guaranteed. There are several reasons why RPO fails for some companies – both big and small. The key to a successful RPO relationship is having a clear understanding about what you are trying to achieve and then choosing the right vendor to help you achieve it. That means getting to the bottom of the recruiting pain your organization is experiencing. Once you can gain that kind of clarity, it sets the stage for not only choosing a vendor, but also for your organization’s expectations and how you will manager your relationship with whichever outsourcer you choose. 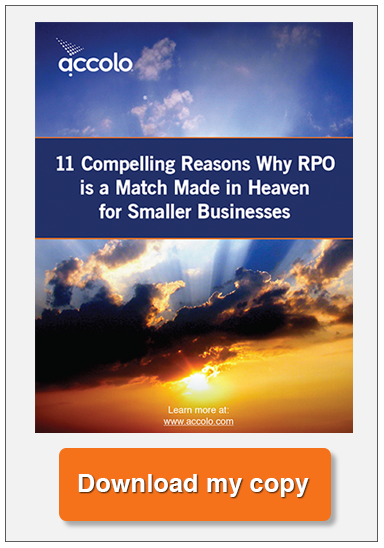 Why Do Companies Explore the RPO Option? Hiring manager dissatisfaction is reaching the executive ranks, and a meaningful change is needed to address this issue. Executives want a more accountable and consistent option than the traditional internal recruiters, contract recruiters, and agencies. Leadership recognizes that hiring the right people is essential to the company’s success, but the process of recruiting these top performers isn’t adequately in place. Metrics related to recruiting quality and costs are either unknown or they highlight the need to address the challenges. There is no single point of accountability and management for the hiring function. There is increased pressure to reduce recruitment expenses, even if the actual expenses may not be known. Often times, organizations focus on reducing cost as the primary reason for considering an RPO and then proceed down the path of finding a cheaper way to meet their recruiting needs. However, what is often missed is that RPO is not a commodity. It is a highly consultative function that manages the people, process, technology, and strategy of your recruiting. It’s not designed to be a “manage your mess for less” type of relationship, and organizations that engage with outsourcers with that kind of expectation are a prime reason why RPO fails. First and foremost, and RPO can certainly help you straighten out your “mess.” That’s where the people, process, technology, and strategy components of an outsourcer come into play. Maybe your organizational culture requires a greater degree of hiring manager handholding throughout the process, or you have periodic bursts to hire large numbers of people without the infrastructure to handle it. RPO can definitely take care of that for you, but the RPO relationship is about more than that. It’s driven by the strategies necessary to improve candidate quality and quantity, increase recruitment responsiveness, decrease overall recruitment spend, and develop a strong employer brand. So an RPO can definitely “manage your mess”, so let’s talk about the costs associated with doing that. Doing it “for less” may be a different story, depending on your expectations. Cost is often one of the primary reasons why an organization explores the possibility of an RPO because it’s one of the few metrics that is known. Unfortunately, the lack of more essential metrics beyond the generic cost per hire number can mislead companies with regard to what they’re really spending on recruiting. The true cost of recruiting can be a real eye-opener for many organizations. Once a company realizes what they’re really spending on the entire recruitment function, RPO can be a very viable option, but you can hardly expect an outsourcer to solve all your hiring problems using fewer resources than your organization is currently allocating. This kind of thinking is one of the reasons why RPO fails. Try to focus on the end result and resist the urge to jump to reducing cost as the primary objective. Hiring employees who perform at a high level and retaining them will dramatically improve your organization’s bottom line. Instead of focusing on costs, look critically at the obstacles currently hindering the achievement of your company’s recruitment goals. If the reasons revolve around the need for greater expertise, improved processes, and better technology, then an RPO will probably make an immediate, measurable, and positive impact. 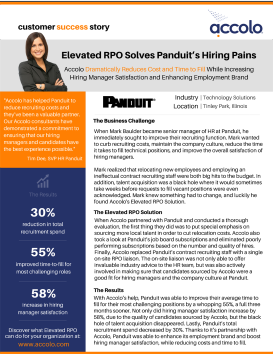 If your recruiting challenges relate to a culture of minimal hiring manager accountability, lack of executive team support, or unrealistic expectations, then you’re building a prime example of why RPO fails for some organizations. While outsourcing is successful for most organizations that engage with an RPO, it’s definitely not true in every case. For those relationships that don’t work, there are a few core reasons why RPO fails to deliver results. 1. Choosing the wrong vendor. Many organizations begin their exploration of RPO with the notion that all RPOs are the same. This couldn’t be further from the truth. In some cases, there are staffing firms that call themselves RPO, even though they don’t offer true RPO solutions. In other cases, a vendor has a niche, industry, or specific job position requirements in which they specialize. There are also instances where an RPO provider prefers to work with very large accounts. They’ll engage with smaller accounts, then really only provide a platform and a few basic tools, rather than a full RPO service. Choosing an outsourcer that can’t meet your organizational needs is recipe for RPO failure. 2. Making a vendor decision based on price. While every organization must keep an eye on costs, choosing an RPO provider based solely on price is a risky proposition. When comparing quotes, be sure to compare apples to apples, not apples to oranges. A bare-bones solution will cost you less on the front end, but may result in expensive add-on costs down the road. As you’re exploring your RPO options, make sure you clearly understand what you’re getting for the quoted price. Every organization has different needs, and every RPO provider you evaluate should be able to clearly identify those needs and prepare a customized approach to meeting them. The one-size-fits-all approach may work for some companies, but it’s really not worth the risk to your hiring function to make the leap that it will work for your organization too. A customized approach is best. Sometimes when a new relationship with an RPO provider begins, the people in your organization expect things to magically change overnight. The reality is that it’s a process that can take 30 days or more to fully implement RPO into your hiring function. It’s also really important for everyone on the team to understand what the RPO responsibilities will be, and what the team will be taking care of themselves. The relationship only works if everyone is clear on their duties. A good outsourcer will help you manage all of these expectations with your leadership, hiring managers, and internal team. If these expectations are poorly managed, your RPO relationship might be on the rocks before it even begins. Regardless of what hiring functions an RPO will be providing, executive buy-in and support is essential. HR leadership must manage and help the department adopt the processes and changes necessary for the RPO relationship to succeed. Lack of real support is often a contributing cause for why RPOs fail. In just about any complex project, issues will come up. That’s true for the RPO relationship as well, and it’s up to your organization and the outsourcer to keep the lines of communication open to deal with anything that arises. While it’s up to the RPO to drive the process and the resolution of any problems, your organization needs to be willing to work through challenges as well. In order for the RPO engagement to be successful, both the organization and the outsourcer need to agree on what that success will look like. Goals need to be agreed on for sure, but there also needs to be a clear agreement on what measurements will be used to determine the goals achieved. Lack of clarity on goals and benchmarks is another reason why RPO fails. Trying to force your new RPO provider to adopt the platform or technology that you were previously using is like putting a square peg into a round hole. Not only will it hinder the process and impede efficiency, but it will also create confusion and prevent timely results. Mismatches in technology can be a key contributing factor in why RPO fails. Realizing you’re in a business partnership with an RPO that just isn’t meeting your organization’s needs is a tough position to be in, but don’t throw in the towel just yet. There are a number of things you can do to set the relationship right. Sometimes what looks like a huge problem with your RPO is really just a minor problem concerning one hiring manager or a RPO recruiter misunderstanding. It’s important to be sure of exactly what problems you’re having with your RPO before you get too disgruntled. Communication issues, problems with the process, and personality conflicts can all be easily remedied. We just discussed how important it is to have open lines of communication with your RPO provider. If you’re having problems with how they’re doing the job, then you have to speak up in clear and certain terms. Once you’ve communicated the problems your organization is having to your RPO partner, you’ve got to give them time to make the necessary adjustments. If you still aren’t satisfied, then talk to them again. If they still haven’t made some serious adjustments in how they’re serving you, then you may be at an impasse. Generally, 30-60 days is plenty of time to give your RPO to make the changes you require. If you’re not seeing any movement in that time, then it may be time to look for a new partner. While you may be in a long-term contract with your current RPO, that doesn’t mean you’re stuck. You may be able to work with a new provider, even if you are still in contract with your old one. It’s not worth sticking with a bad RPO provider when it’s not working. Bad recruiting has too much impact on your organization to wait it out, but if you feel compelled to hang on until your contract ends, you can still start speaking with other providers. The next time, you’ll know exactly what you need and be better prepared to vet your options. Clearly there are several core reasons why RPO fails, but now that you know the most common reasons, you’re sure to find the right RPO partner for your organization. The most important key to building that successful partnership is to have a clear understanding about what you’re trying to achieve and then choose a RPO provider that best meets your needs. Once you’re clear about what your organization needs out of a RPO, vetting possible providers is fairly simple. Just remember, RPO is not about hiring someone to “manage your mess for less.” It’s about finding the perfect partner to manage the people, process, technology, and strategy of your hiring function. There is no single best option, only the option that best aligns with your organizational needs. Want to Increase Productivity? Plan for a More Productive Week! How Can Key Company Persons Improve Employer Brand? Ageism in the workplace is real... Are you missing out on great talent because of it? The talent chasing, job marketing, cost reducing, noise killing, fill the job right and make you look good people.